Received June 12, 2015; Revised June 15, 2015; Accepted June 28, 2015. 무치악 환자에서는 치아가 상실되면서 주위 치조골의 개조와 흡수가 일어나고, 이에 따라 총의치의 유지력 감소, 저작효율의 저하와 통증으로 인해 의치 사용에 어려움을 겪게 된다. 이를 개선하기 위해 하악에 2 - 4개의 임플란트를 식립하고 어태치먼트에서 유지 또는 지지를 얻는 피개의치가 바람직한 치료 방법으로 고려되고 있다. 본 증례들은 하악 완전 무치악 환자들을 악간 관계, 골흡수 정도, 안모지지 등을 평가하여 하악에 2개의 임플란트 식립을 고려하고, 다양한 종류의 어태치먼트를 이용한 임플란트 피개의치 수복을 계획하여 치료하였다. 주기적인 경과 관찰 결과 심미적, 기능적으로 만족할만한 결과를 얻었기에 이를 보고하는 바이다. Implant overdenture treatment using several solitary attachment systems on mandibular edentulous patients. Most patients with severe residual ridge resorption report significantly more problems adapting to their mandibular denture due to a lack of comfort, retention, stability and to the inability to chew and eat. Recent scientific studies carried out over the past decade have determined that the benefits of a mandibular implant overdenture are sufficient to get retention and stability. Therefore, overdenture with implants on the mandible and attachments are considered as a treatment of choice as a favorable treatment. 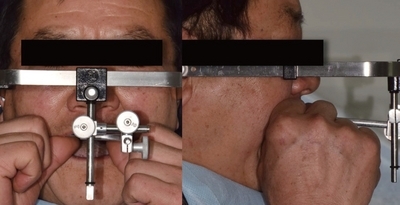 In this cases, with consideration for jaw relation, level of bone loss, facial support and economic factor, edentulous patients with severe residual ridge resorption are rehabilitated by complete denture on maxilla and two-implants overdenture using several solitary attachment systems on mandible. 본 증례들은 완전 무치악 환자에게 상악은 통상적인 총의치로, 하악은 서로 다른 종류의 어태치먼트를 이용한 임플란트 피개의치로 수복하였다. 첫 번째 증례는 64세 남자 환자로서 틀니를 만들고 싶다는 주소로 본원에 내원하였다. 구강 검사와 방사선 사진 검사에서 다수 치아의 상실 및 만성 치주염으로 인한 전반적인 치조골 흡수가 관찰되었다(Fig. 1). 전악 발치 후 상하악 예비인상을 채득하여 진단 모형을 제작하여 평가하였다(Fig. 2). 상하악 잔존 치조제는 하악이 다소 전돌된 class III 골격 관계를 나타내고 있었고, 하악운동의 제한이나 측두하악관절 장애 증상은 보이지 않았다. 하악의 이공 사이에는 임플란트를 식립 하기에 충분한 양의 골이 존재하는 것을 확인할 수 있었으며, 이외의 특이 소견은 발견되지 않았다. 임플란트 고정성 수복이 가능하였으나, 경제적인 부담과 환자의 수술에 대한 거부감으로, 상악은 통상적인 총의치, 하악은 임플란트 피개의치를 계획하였다. Bar type의 어태치먼트를 고려할 수 있었으나, 전악 발치 후 치아의 상실 기간이 상대적으로 오래되지 않아 치조골량이 충분하여 악간 공간이 부족한 경우에 우선적으로 선택되어질 수 있는 KERATOR? 어태치먼트를 선택하였다. 하악의 견치 부위에 임플란트를 식립 하기로 결정 후, 임시 의치를 복제하여 진단 방사선 스텐트를 제작하고 컴퓨터 단층 영상 촬영을 시행하였다. 이를 토대로 하악 양측 견치 부위에 OSSTEM TS III Φ4.0 × 10.0 mm (OSSTEM, Seoul, Korea)의 임플란트를 식립 하였다(Fig. 3). Initial panoramic view of the first patients. Generalized alveolar bone loss and multiple missing of teeth state are found. Diagnostic casts of first patient. Implant installation with healing abutments was found on both mandibular canine area. Intraoral views after implants placement with healing abutment adaptation. This patient with Class III had relatively narrow inter-occlusal space. 3개월의 치유 기간을 가진 후, Osstell mentor (Osstell, Gothenburg, Sweden)를 이용하여 임플란트 안정성을 확인(ISQ = 72)하고 보철 수복을 진행하기로 하였다. 상하악 예비인상을 채득하여 진단모형을 제작 후 최종 인상용 트레이를 제작하였으며, 하악의 트레이는 후방 치조제의 지지를 얻기 위하여 협붕 부위의 완압은 하지않았다. 상하악의 최종 인상채득은 모델링 콤파운드를 이용해서 변연 형성을 하였고, 하악의 경우 추가적으로 임플란트 지대주에 인상용 코핑을 연결하고 실리콘 계열 인상재(EXADENTURE, GC, Tokyo, Japan)를 이용하여 최종 인상을 채득하였다(Fig. 4). 하악은 인상 채득 후 인상용 코핑에 아날로그를 체결하여 주모형을 제작하고 기록상과 교합제를 제작하였다. 교합제를 구강 내에 시적하여 동공간선과 비익이주선을 기준으로 교합 평면을 설정하였고, 이를 바탕으로 중심위 기록을 채득하여 안궁 이전을 시행하였다(Fig. 5). 인공 치아는 환자의 성별, 안모, 피부색 등을 고려하여 전치부는 Endura (Shofu, Kyoto, Japan) HC4 Shade 106, 구치부는 Endura (Shofu) M30 Shade 66을 선택하였고, 총의치의 안정을 고려하여 양측성 균형교합을 부여하여 배열하였다. Border molding and final impression. Establishing the occlusal plane and taking the face-bow transfer. Frontal line was parallel to the inter-pupillary line, lateral line is parallel to Frankfort horizontal plane. 납의치를 시적 하여 수직고경, 교합평면, 수평·수직 피개량, 안모의 심미성을 평가하였다. 납의치를 매몰 후 레진 전입 및 온성을 시행하여 상하악 의치를 완성하고 기공실 재부착 과정을 거쳐 교합조정을 시행하였다. 제작된 의치는 구강 내에서 Fit checker (GC)를 이용하여 의치상의 조직면 적합도와 변연 연장 정도를 평가하고 양측성 균형교합을 확인하였다. 조정이 완료된 후, 어태치먼트의 부착을 위하여 구강 내 임플란트에 KERATOR? 어태치먼트를 체결하여 white block-out spacer를 위치시키고 메탈 하우징을 연결하였다. 그리고 의치의 내면에는 어태치먼트를 위한 공간을 형성한 후, 해당 부위에 아크릴릭 레진을 적용하여 구강 내에 안착시켰다. 의치는 중합 완료 후에 white block-out spacer를 제거하고 연마하여 의치를 완성하였다(Fig. 6, 7). Final dentures and installation of retention part of KERATOR attachment (Circles of dot indicate laboratory black male cap). Intraoral views with final dentures. All teeth contact opposite side evenly on centric relation. 두 번째 증례는 58세 남자 환자로서 틀니를 새로 만들고 싶다는 주소로 임플란트 식립 후 본원에 내원하였다. 구강 검사와 방사선 사진 검사에서 상하악 무치악으로 전반적인 치조제 상실과 함께 하악 양측 견치 부위에 OSTEM TS III Φ4.0 × 10.0 mm (OSSTEM)의 임플란트가 관찰되었다(Fig. 8). 임플란트의 식립 각도가 평행하지 않았고(Fig. 9), 직업상 이유로 잦은 치과 내원이 어렵다고 하여, 어태치먼트는 보상성이 우수하고 유지부의 교체 없이 비교적 장기간 사용할 수 있는 EZ-LOCK? (TM Dental)을 선택하였다. EZ-LOCK? (TM Dental) 하우징의 부착 방법은 환자 구강 내에서 직접 장착시키는 직접법과 기공실에서 장착시키는 간접법 모두 가능하며, 진료 시간 단축과 기공 과정의 편의성을 위하여 간접법을 이용하기로 결정하였다. 하우징은 주모형상에서 교합면과 최대한 평행하게 조절하여 부착하였으며, 통상의 방법에 따라 의치 제작을 완료하였다(Fig. 10). Panoramic view of the 2nd patient at implants installation on mandibular both canine area. Intraoral views after implant placement with healing abutment adaptation. It shows that direction of implants is non-parallel. 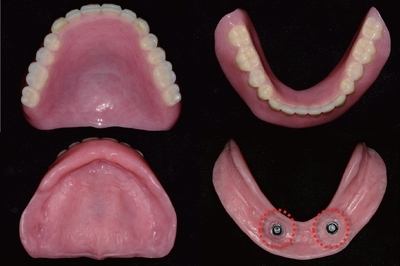 Final dentures and installation of retention part of EZ-LOCK attachment on final denture (Circles of dot indicate EZ-LOCK metal housing). 세 번째 증례는 50세 남자 환자로서 이가 흔들려서 틀니를 하고 싶다는 주소로 본원에 내원하였다. 구강 검사와 방사선 사진 검사에서 전반적인 골흡수 양상을 보였으나, 하악의 이공 사이 견치 부위에는 임플란트를 식립하기에 충분한 양의 골이 존재하였다. 오랜 기간 구치부 상실로 인하여 구치부 치조제가 낮고 좁으며, 날카로운 형태를 보였다. 이에 치조제 흡수가 심하고 좁은 치조제를 갖는 경우에 사용될 수 있는 Dentium NR Line Φ3.2 × 9.0 mm (Dentium, Seoul, Korea)의 임플란트를 하악 양측 견치 부위에 식립 하였으며(Fig. 11, 12), 어태치먼트는 Dentium NR Line 전용 magnet을 선택하였다. 통상의 방법에 따라 의치를 제작한 후, 구강 내에서 임플란트에 keeper를 체결하여 magnet을 연결하고, 제작된 의치의 임플란트 식립 부위에 vent hole을 형성하여 직접법으로 부착하였다(Fig. 13). 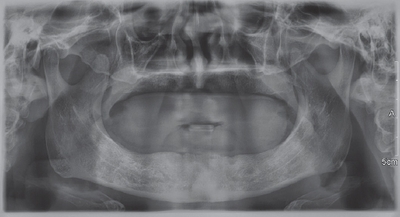 Panoramic view of the 3rd patient with fully edentulous state on maxilla and mandible. As posterior teeth of mandible have been missing for a long time, severe residual ridge resorption was found. Intraoral views after implant placement with healing abutment adaptation. It shows that severe resorption of alveolar ridge on mandibular posterior area. 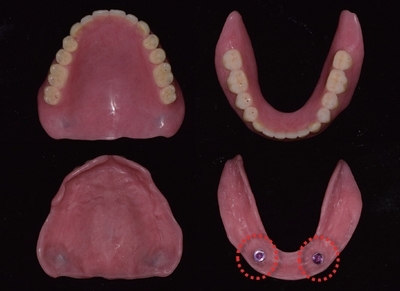 Final dentures and installation of retention part of magnetic attachment on final denture (Circles of dot indicate magnetic attachment). 위 증례의 환자들은 의치 사용 및 관리 방법과 구강위생관리에 대해 교육한 후, 장착 24시간 후 재 내원 하도록 하여 의치 조정을 시행하였으며, 주기적인 검진 및 내원의 필요성에 대하여 주지시켰다. 환자는 의치의 기능과 심미성 모두에서 매우 만족하였으며 정기 점검 시에도 불편감 없이 만족스럽게 사용하였다. 완전 무치악 환자에서 상악의 경우 넓은 지지 면적과 변연 봉쇄를 이루기 용이하여 유지력을 확보하기가 쉽고, 통상적인 총의치에도 환자의 만족도가 높다. 반면, 치조제 흡수가 심한 하악의 경우에는 통상적인 총의치보다 유지력과 안정성이 우수한 임플란트 피개의치는 무치악 환자에게 바람직한 치료법으로 평가되고 있다.15,16 위와 같은 이유로 본 증례에서는 완전 무치악 환자에서 상악은 통상적인 총의치, 하악은 임플란트 피개의치로 수복을 계획하였다. 임플란트 피개의치의 어태치먼트는 임플란트 식립 수, 위치, 식립 각도 등에 따라 적절히 선택하여야 한다. 본 증례에서는 악간 공간과 임플란트 식립 각도, 환자의 구강 상태를 고려하여 solitary type의 어태치먼트를 선택하였다. 첫 번째 증례에서는 악간 공간이 좁고 충분한 유지력이 필요하여 KERATOR? 어태치먼트를, 두 번째 증례에서는 임플란트 식립 각도의 보상이 필요하며 반영구적인 유지 장치가 필요하여 EZ-LOCK? 어태치먼트를 선택하였다. 세 번째 증례의 Dentium사의 NR Line 임플란트는 치조제 흡수가 심하여 좁은 치조제를 갖는 경우에 사용된다. 식립 된 임플란트의 종류에 따라 호환되는 어태치먼트를 확인하여야 하는 경우도 있는데, NR Line 임플란트는 강한 sealing 효과를 위하여 임플란트 내부각도를 10°로 부여하여 타사의 내부 각도 11°와 다르기 때문에 다른 어태치먼트와 호환이 불가하므로 Dentium 전용 magnet 어태치먼트를 선택하였다. Magnet 어태치먼트는 keeper와 자석 사이의 거리에 따라 유지력의 급격한 저하가 보고되기 때문에,13 부착 과정에서 술자의 세심한 주의가 요구된다. 어태치먼트를 의치 내면에 부착하는 방법으로는 환자 구강 내에서 직접 부착하는 직접법과 기공실에서 기공 과정을 통해 부착하는 간접법이 있다. 직접법은 술자의 숙련도가 요구되고 아크릴릭 레진에 의한 화학적 자극과 구강 내 작업 시간이 증가할 수 있으나 간접법과 비교하여 보다 정확한 위치에 어태치먼트를 장착할 수 있으며, 간접법은 인상용 코핑과 아날로그 연결 등의 인상 과정에서 오차가 발생할 가능성이 있으나 아크릴릭 레진에 의한 화학적 자극과 중합수축이 적으며 진료 시간 또한 단축시킬 수 있다.17 술자는 임상 상황에 따라 적절한 부착 방법으로 어태치먼트를 정확한 위치에 부착하여 유지력을 증진시키고, 불필요한 어태치먼트의 마모를 방지하여 내구성을 향상시킬 수 있도록 해야 할 것이다. 임플란트 피개의치는 치료 이후의 적절한 유지 관리가 실질적인 장기적 성공의 요인이다. 임플란트의 생물학적, 기계적 실패를 막기 위해서는 임플란트 지대주에 가해지는 힘의 조절이 필요하며, 구강위생관리가 적절히 행해지지 않을 경우 어태치먼트에 음식물이 침착 되어 의치의 올바른 안착을 방해하거나 임플란트 주위의 염증을 유발할 수 있으므로, 의치 내면과 어태치먼트 주위의 적절한 구강위생관리가 필수적일 것이다. 또한 제작된 의치는 치조골 흡수에 따른 조직의 변형에 대한 적절한 재이장과 교합 조정이 필요하다.18 본 증례들은 주기적인 검진과 경과 관찰을 통하여 모든 환자는 기능적, 심미적으로 만족할만한 결과를 얻었다. 본 증례들에서는 수종의 solitary type 어태치먼트를 이용한 임플란트 피개의치를 제작하였으며, 모든 환자는 탈착에 어려움 없이 의치의 유지력과 심미에 만족하였다. 이와 같이 치조제 흡수가 심한 무치악 환자에서 어태치먼트를 이용한 임플란트 피개의치 수복은 의치의 유지 및 지지의 측면에서 유리하고, 임플란트 고정성 수복과 비교하여 저작력은 다소 떨어지지만, 치조제 흡수가 심하여 구순의 지지가 필요한 경우에 보다 심미적이며, 경제적 측면에서도 만족할만한 치료 방법으로 사료된다. Feine JS, Carlsson GE, Awad MA, Chehade A, Duncan WJ, Gizani S, Head T, Lund JP, MacEntee M, Mericske-Stern R, Mojon P, Morais J, Naert I, Payne AG, Penrod J, Stoker GT, Tawse-Smith A, Taylor TD, Thomason JM, Thomson WM, and Wismeijer D. The McGilll consensus statement on overdentures. Montreal, Quebec, Canada. May 24-25 2002. Int J Prosthodont 2002;15:413-4. Rissin L, House JE, Manly RS, and Kapur KK. Clinical comparison of masticatory performance and electromyographic activity of patients with complete dentures, overdentures and natural teeth. J Prosthet Dent 1978;39:508-11. Kapur KK, and Soman SD. Masticatory performance and efficiency in denture wearers. J Prosthet Dent 1964;4:687-94.
van Steenberghe D, Quirynen M, Callberson L, and Demanet M. A prospective evaluation of the fate of 697 consecutive intraoral fixtures ad modum Br?nemark in the rehabilitation of edentulism. J Head Neck Pathol 1987;6:53-8. N?rhi TO, Geertman ME, Hevinga M, Abdo H, and Kalk W. Changes in the edentulous maxilla in persons wearing implant-retained mandibular overdentures. J Prosthet Dent 2000;84:43-9. Kapur KK, Garrett NR, Hamada MO, Roumanas ED, Freymiller E, Han T, Diener RM, Levin S, and Wong WK. Randomized clinical trial comparing the efficacy of mandibular implant supported overdentures and conventional dentures in diabetic patients. Part III: comparisons of patient satisfaction. J Prosthet Dent 1999;82:416-27. Geertman ME, Van Waas MA, van’t Hof MA, and Kalk W. Denture satisfaction in a comparative study of implant-retained mandibular overdenture: a ramdomized clinical trial. Int J Oral Maxillofac Implant 1996;11:194-200. Gotfredsen K, and Holm B. Implant-supported mandibular overdentures retained with ball or bar attachments: a randomized prospective 5-year study. Int J Prosthodont 2000;13:125-30. Bakke M, Holm B, and Gotfredsen K. Masticatory function and patient satisfaction with implant supported mandibular overdentures: a prospective 5-year study. Int J Prosthdont 2002;15:575-81. Thiel CP, Evans DB, and Burnett RR. Combination syndrome associated with a mandibular implantsupported overdenture: a clinical report. J Prosthet Dent 1996;75:107-13. Maxson BB, Powers MP, and Scott RF. 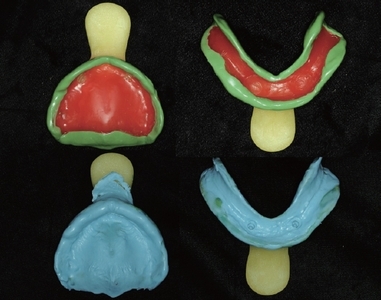 Prosthodontic considerations for the transmandibular implant. J Prosthet Dent 1990;63:554-8. Barber HD, Scott RF, Maxon BB, and Fonseca RJ. Evaluation of anterior maxillary alveolar ridge resorption when opposed by the transmandibular implant. J Oral Maxillofac Surg 1990;48:1283-7. Schneider AL, and Kurtzman GM. 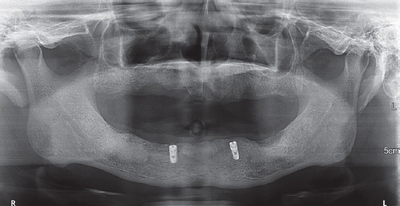 Bar overdentures utilizing the Locator attachment. Gen Dent 2001;49:210-4. Heckmann SM, Winter W, Meyer M, Weber HP, and Wichmann MG. Overdenture attachment selection and the loading of implant and denture-bearing area. Part 2: a methodical study using five types of attachment. Clin Oral Implants Res 2001;12:640-7. Sadowsky SJ. Mandibular implant-retained overdentures: a literature review. J Prosthet Dent 2001;86:468-73. Carlsson GE, Lindquist LW, and Jemi T. Long-term marginal periimplant bone loss in edentulous patients. Int J Prosthodont 2000;13:295-302. 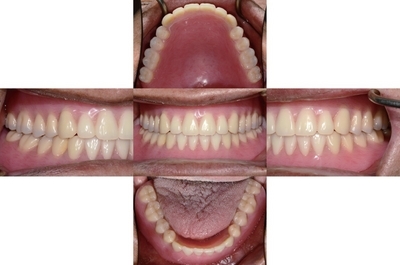 Nissan J, Oz-Ari B, Gross O, Ghelfan O, and Chaushu G. Long-term prosthetic aftercare of direct vs. indirect attachment incorporation techniques to mandibular implant-supported overdenture. Clin Oral Implants Res 2011;22:627-30. Bilhan H, Geckili O, Mumcu E, and Bilmenoglu C. Maintenance requirement associated with mandibular implant overdentures: clinical results after first year of service. 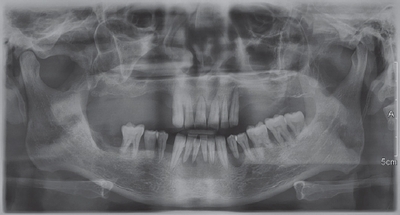 J Oral Implantol 2011;37:697-704.